The Archbishop of York, John Sentamu, has jumped 13,000ft out of a plane to raise money for families of soldiers injured in Afghanistan. 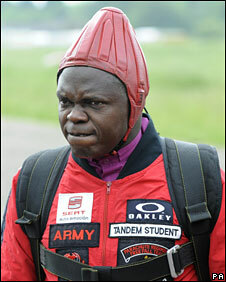 It was Dr Sentamu's second attempt at the parachute jump with the Red Devils display team. His first was cancelled last month because of bad weather. He said: "I was praying like anybody's business up there. It was an amazing, amazing experience." The tandem skydive took place at RAF Langar, near Nottingham. The archbishop was joined by businessman Guy Brudenell, who also braved the jump to raise money for the Afghanistan Trust. 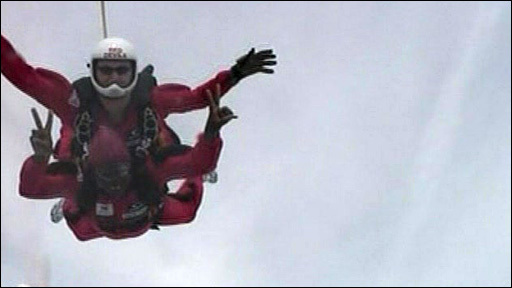 Both of the men were strapped to a member of the Red Devils parachute team while free falling for 45 seconds before their parachutes opened at 5,000ft. "It was fantastic. We were at 13,000ft and then we free-falled for 35 seconds. It happened very quickly and then the man I was with started spinning around. It was absolutely exhilarating." During the fall, two members of the Red Devils joined them mid-air for a mini-display routine and had orange smoke streaming from canisters strapped to their legs. Moments after landing in a sitting-down position, the Archbishop held his hands in the air to signal he was OK. He then took his helmet off and was given a hand up by a member of the Red Devils to have his photograph taken and a final take for the mid-air video that was filmed during his jump. L/Cpl Lee Read, who jumped in tandem with the Archbishop, said: "Dr Sentamu was a very good student. "He was very calm on board the flight, although he didn't say a great deal. The jump went very well." Asked why he did the jump, Dr Sentamu said: "It's important for citizens of this country to value those who risk their lives for the sake of this country so I'm doing my part."